The May 1950 issue of The Inco Triangle reported on the first building in Copper Cliff. The log cabin was built about 1850 by a beaver trapper, on the site of the former Racicot-Darrach Co. Ltd. Department Store and the current LCBO Store on Serpentine Street in Copper Cliff. The photograph was taken in 1880 by a travelling photographer. The cabin was bought by George Fielding for $25. and used as a hunting and trapping clubhouse by a group of friends. The man standing in the centre of the photograph was Jim Avery, a legendary practical joker. The gun he is holding is one of the old muzzle-loaders. The long barrel served a secondary purpose as a yardstick for measuring stacks of beaver pelts when trading with the Aboriginal peoples in Canada. Seated on the far right is George Parker Fielding in the straw hat, who was born at Markey Drayton in Manchester, England January 2nd, 1858. From the 1881 Census of 13 Church Street, Royton, Lancashire, England Mary Parker Fielding, age 41, mother, son John J. Fielding, age 18, Benjamin, age 17 and George, age 15, occupation cotton piecer. Father was Henry Fielding. George had helped to build the railway into Manchester before he came to Canada. His father dealt in lumbering transactions, and his brother Frank was a policeman in Manchester. George came out to Sudbury as a young man (about 1897). His first job was working on the Canadian Pacific Railway right-of-way to Sault Ste. Marie. George was one of the first tappers and skimmers in the Canadian Copper Company smelter at Copper Cliff, before he settled on a farm in Waters Township. In 1896 he worked at the Evans, Copper Cliff No. 2, Stobie, Crean Hill, and Murray Mines. 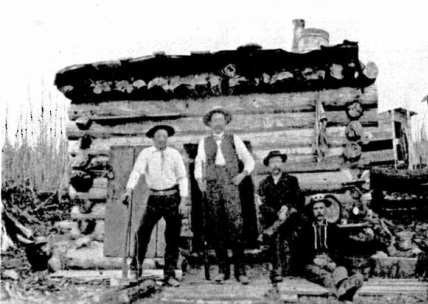 During the boom in Cobalt, George Fielding prospected with Jim Baggat, the prospector sitting to the right of Jim Avery. George Parker Fielding, age 33, Farmer, married Agnes Caesar, age 25 on Mary 24th, 1899 in Nipissing District. Agnes was born in Sweden on September 4, 1874 to Adam Caesar and Johanna Anderson. Witnesses at the wedding were William Jarvis and Annie Caesar, at Sudbury. Agnes came to Canada with her parents. Her father Adam Caesar sold a rich claim on his property on the west shore of Kelly Lake to J. D. Evans and it became Evans Mine. From the 1901 Census of Snider and Waters Township, Nipissing District, George Fielding, age 35, born January 2nd, 1866 [different date on death certificate] in England, Church of England, Farmer, his wife Agness, age 26 and daughter Amy C. age 9 months. Living with them was a lodger James Williamson, age 25, Scotch origin, Farm Hand, employed for 12 months earning $300. 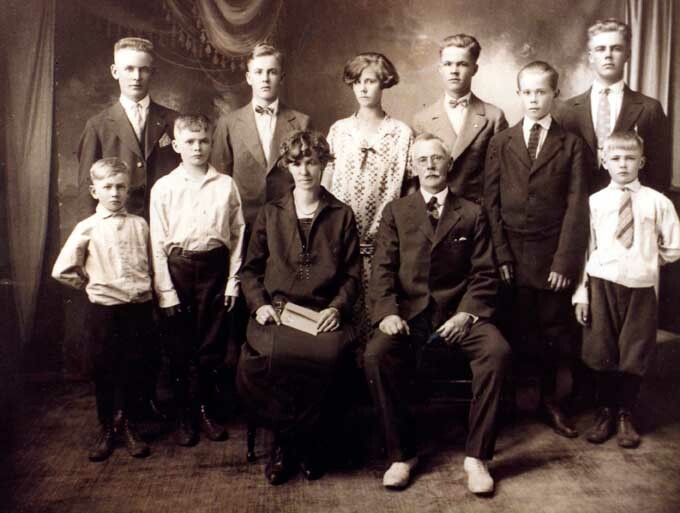 From the 1911 Census of Waters Township, Algoma East District, George Parker Fielding, age 46, Farmer, his wife Agnes, age 38, and their children Amy C., age 10, Frank, age 8, George Edward, age 7, Garnet, age 6, Sidney, age 4 and Stanley, age 2. Agnes Florence was born in 1910 and died the same year. Carman was born in 1913, Clifford Alexander was born in 1915 and Cecil Fielding was born in 1918. George Parker Fielding died in Sudbury on March 8, 1937 at age 79.